A new bus in our neighborhood! 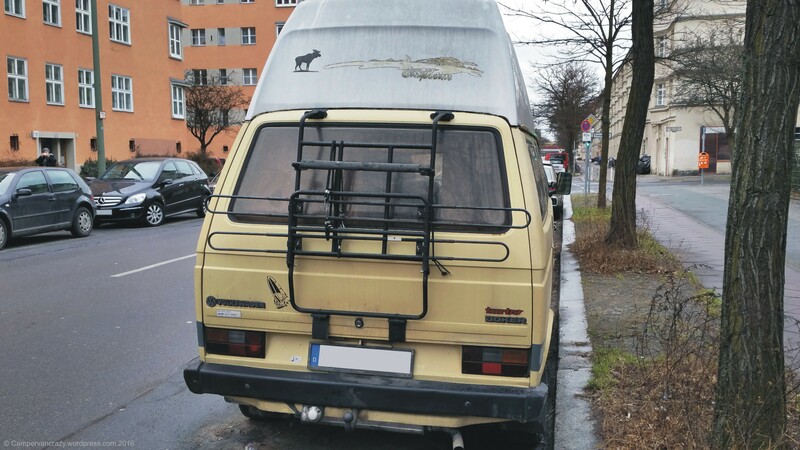 It is a VW T3 (or T25 or Vanagon) which was produced in Germany between 1979 and 1992. 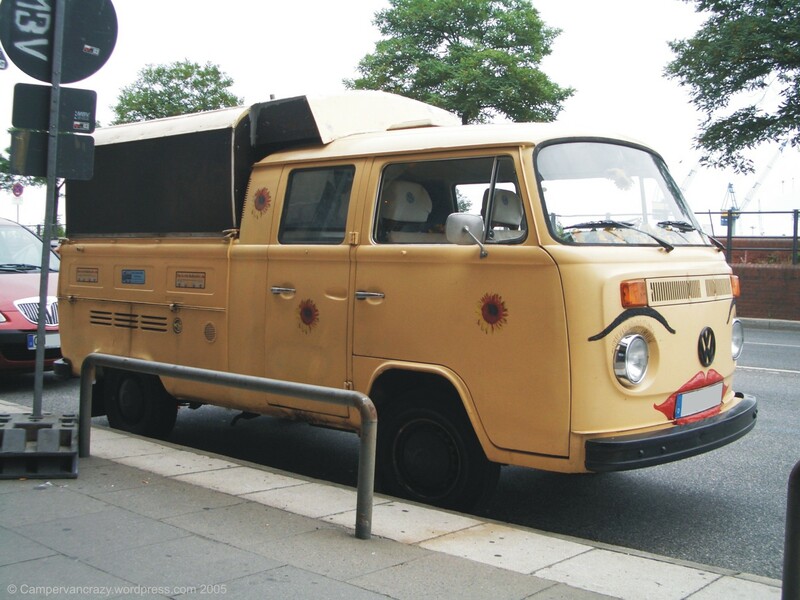 And it is a Joker, a campervan which was sold directly by Volkswagen, but with a camper conversion from Westfalia. 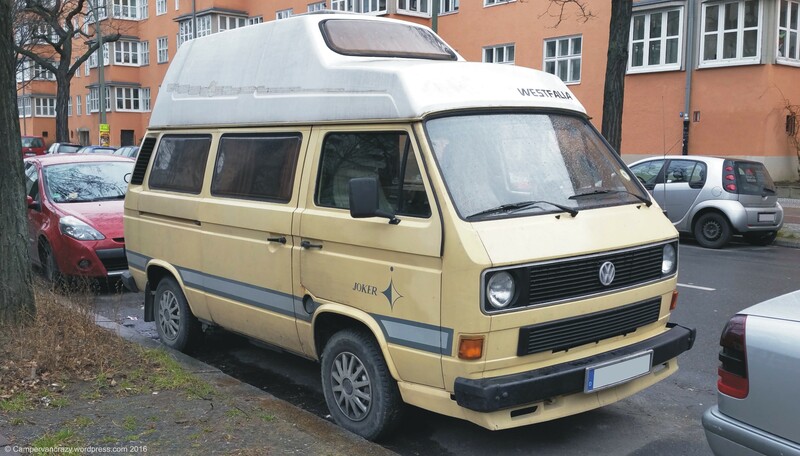 The German T3 Wikipedia page lists the different T3 Westfalia campervan conversions sold by Volkswagen as the models Camping (till autumn 1983), Joker, Joker Plus, California and Atlantic. 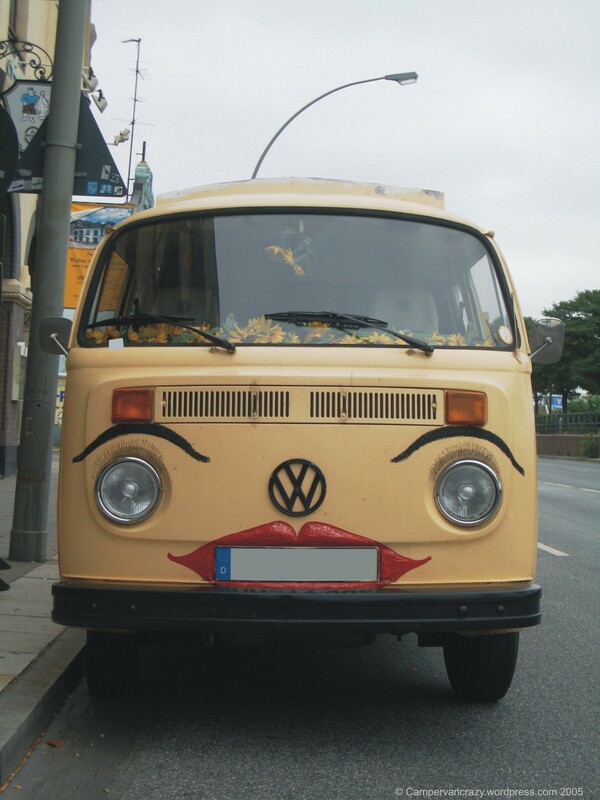 So the Joker is a predecessor of the first California, which VW builds up to now, and nowadays independent of Westfalia. There is a beautiful blog post by WildAboutScotland on the history of the California. With the extra front grill below the head light grill this bus already comes with a water-cooled engine, so it is rather from post-1982. The early T3s still came with air-cooled flat four engines taken over from the late T2/bay window buses. 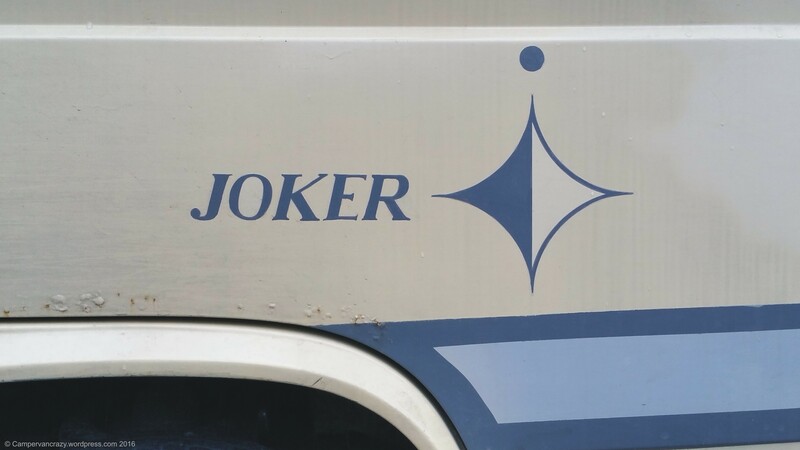 Wikipedia is not very informative on the different T3 Joker generations, but the Volkswagen Westfalia T3 Camper van site provides a lot of background information. 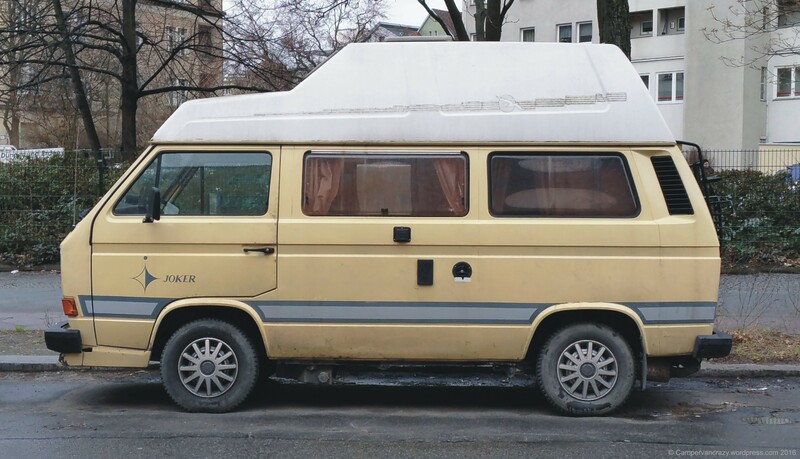 Looking at the available color options at the time, this bus is ivory beige (German elfenbeinweiß, VW color code L567). The high top version here was apparently added to the model range only in the late 1980s (model Joker 3 or Joker 4, depending on the interior set up). The earlier Jokers rather came with pop-up roofs instead of hard tops. Interesting that the head lights are round and not yet rectangular. 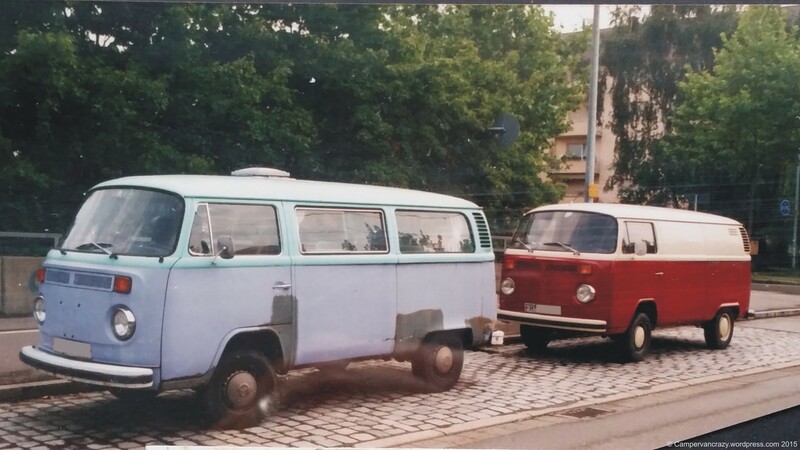 Anyway, welcome to our neighborhood, good to have more kombis around! 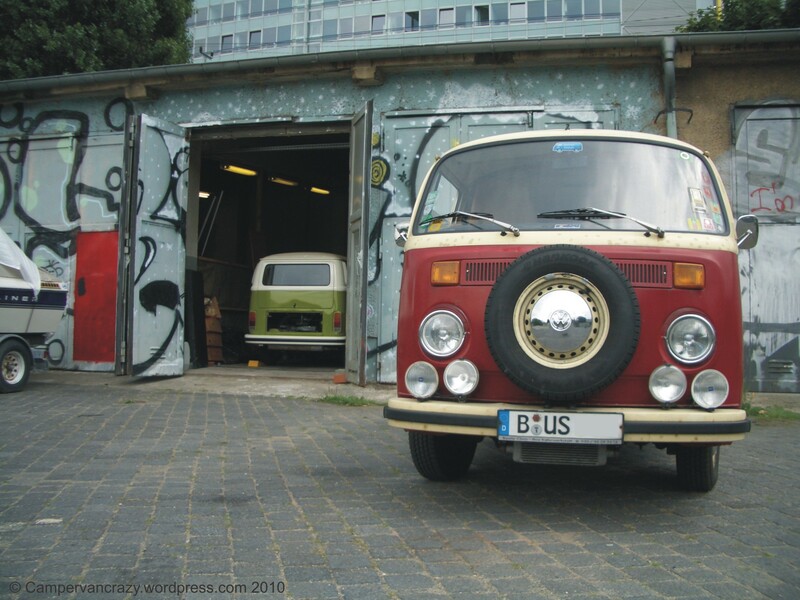 20 years of kombi mania! 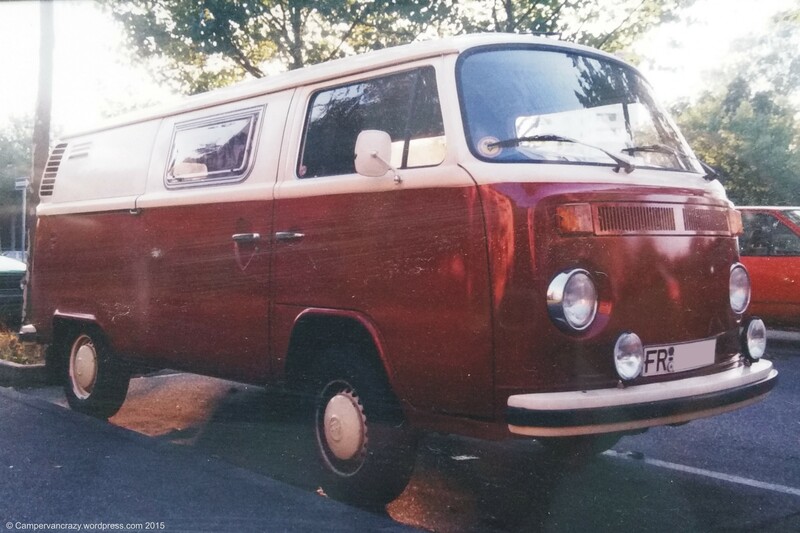 It all began on July 24, 1995: On that day I bought my first kombi, a 1978 late bay panel van from the German Red Cross, with a 50 h.p. 1600 ccm flat four/boxer engine. 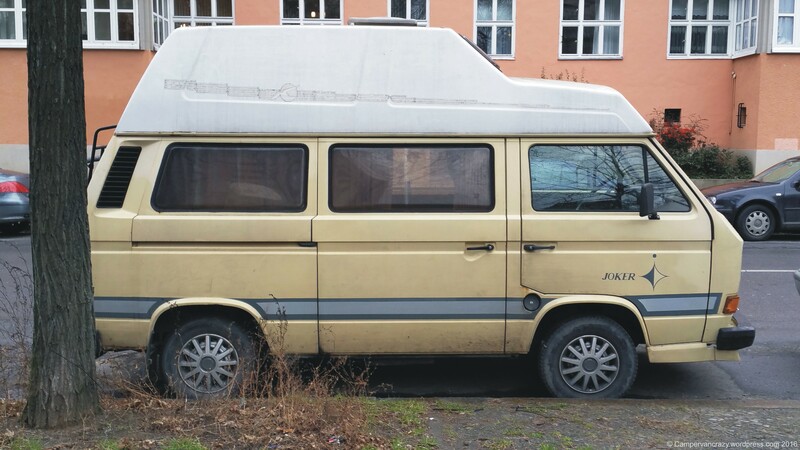 It was 17-years-old, cost a friendly 3500 DM (1500 Euro) and came with only 40.000 km on the clock. 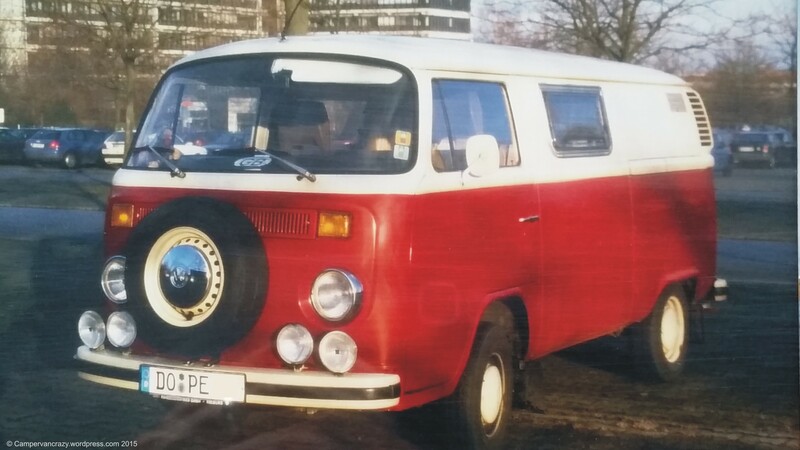 Top in original ambulance white (Ivory White), lower half re-sprayed by a car dealer in Volkswagen Classic red. The rear was completely empty except for a crude metal shelf which the Red Cross had installed. I remember I was sitting on the first evening in my bus and tested the very limited number of switches and lights on the dashboard. The best one was the blue light for the high beam. Not much else there – the Red Cross had ordered the no frills version. I started rebuilding her into a campervan, with adding fold-up campervan windows on both sides in the back to bring more light into the rear. I thought I could get the complete conversion (bed, kitchen and cupboards) done in six weeks, in time for the first trip with my two brothers through Switzerland in September. 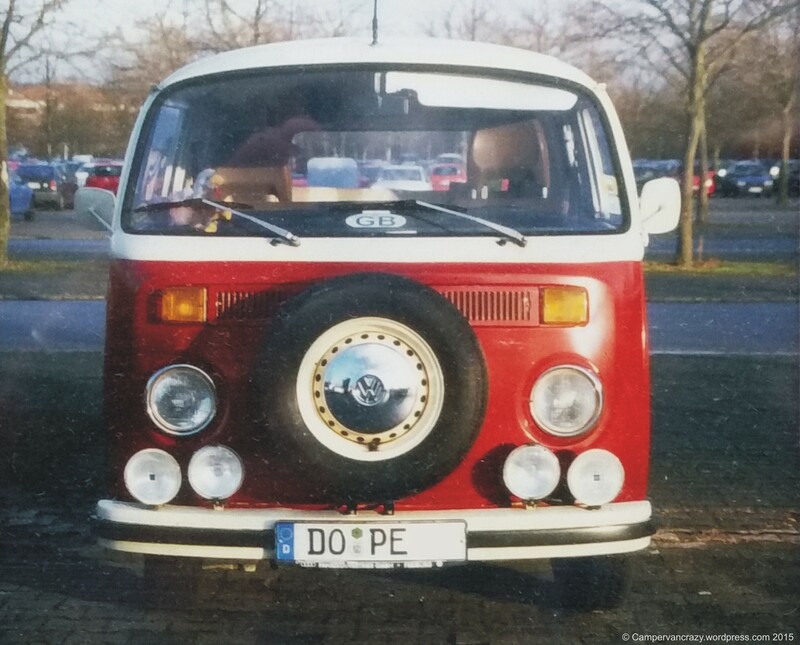 In the end it took 12 years until it was a fully functional campervan. So the Switzerland trip was still with matrasses thrown into the back, no kitchen block at all and a portable battery-powered radio-cassette player instead of a car stereo. But it was a great trip. In 1997, a porta potti and a fold-out bed (my own construction) were added. I rebuilt the bed to a conventional rock-and-roll bed in 2005. Less sophisticated mechanism, easier to use. In 1999 the spare wheel went from under the front bench to the front of the car. 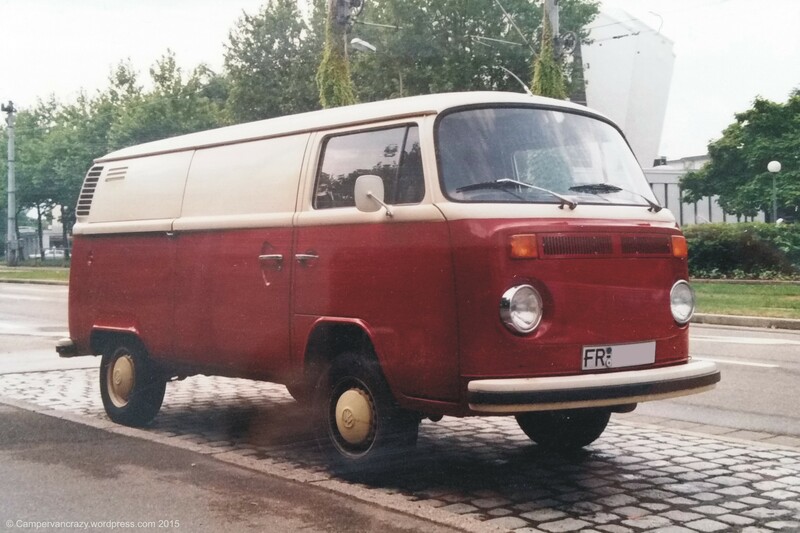 A very basic kitchen block was added in 2000 when the bus was officially re-registered from a truck/delivery van to a campervan. In 2002 a catalytic converter was added. The kitchen was replaced by a much more refined version (including a 5L gas bottle, gas cooker and gas/12V/220V fridge) in 2007. In 2007, also the dividing wall between driver’s cabin and rear area was removed and driver’s seat and double passenger seat-bench were replaced by two caravan pilot seats, with the passenger seat on a turn table. 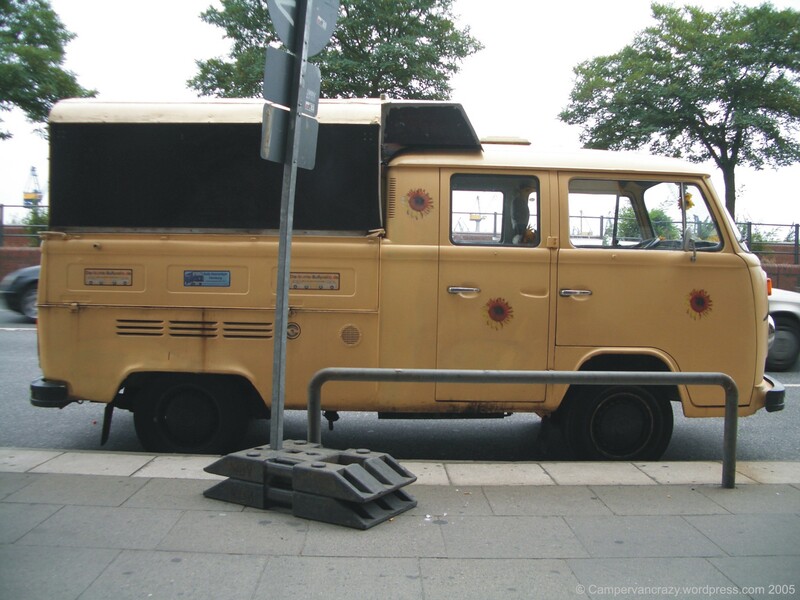 The van accompanied me when I moved from Freiburg to Dortmund and later on to Berlin. 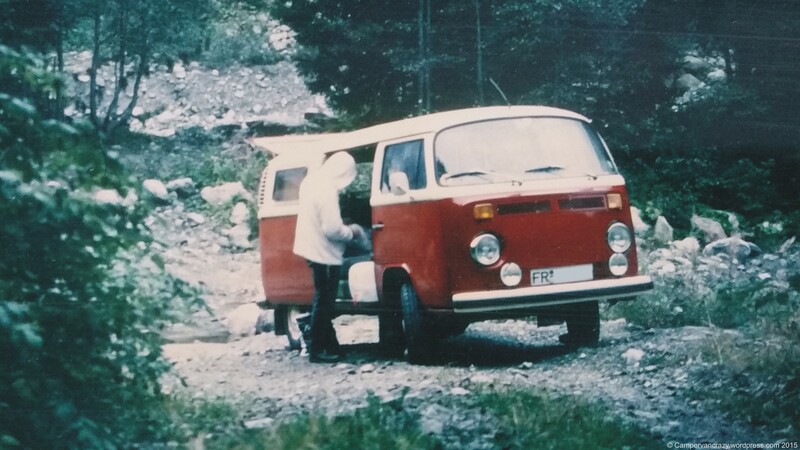 It was vehicle and home for many trips through Western Europe and Scandinavia and my daily driver for all that time. Its active duty ended with 225.000 km on the clock in 2010. Rust in many hidden corners required a full restoration. I did not have the money to do this right away, so we retired her and put her into storage. Our second bus, Taiga Lily, came into our life in 2010 and was road-worthy in 2011. While the first bus was most of the time simply called “the Bulli” (German nickname for the kombi), it transitioned into “Old Lady” when the much more youthful and less rusty Taiga Lily entered the stage. But today this is to you, Old Lady! May you be back on the road some time in the future! 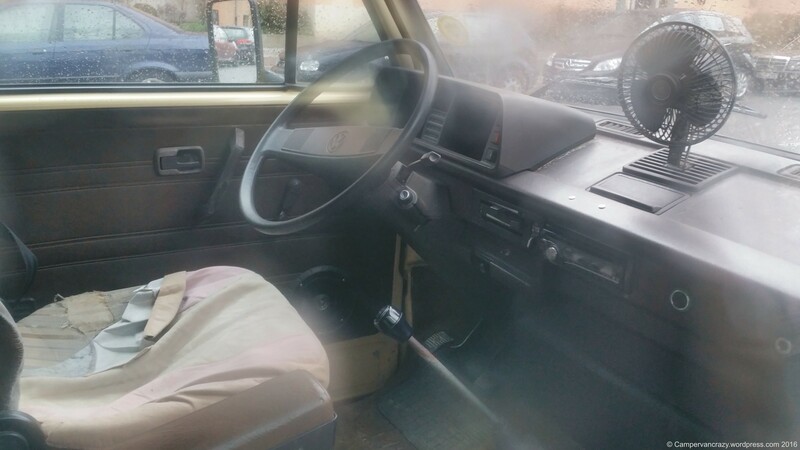 The beginning: a naked panel van. Random meeting with another late bay. A few weeks later: Windows added in the rear, additional high beams at the front. First trip, somewhere in the Swiss Alps. 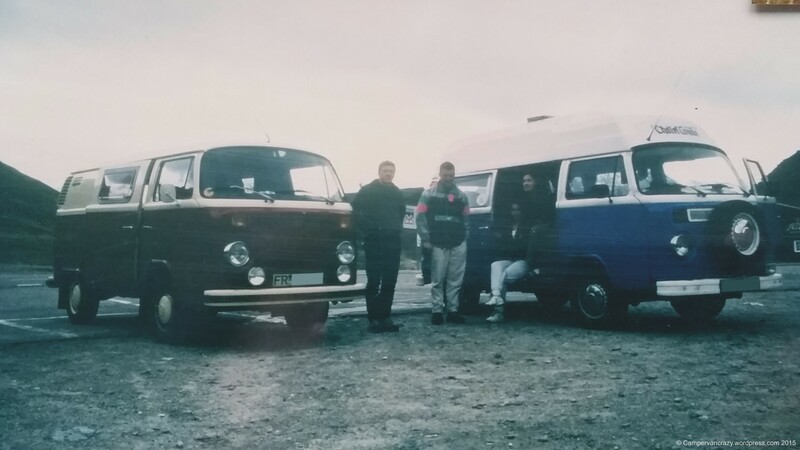 Random kombi meeting in Switzerland: Travellers from New Zealand with rental kombi from London. 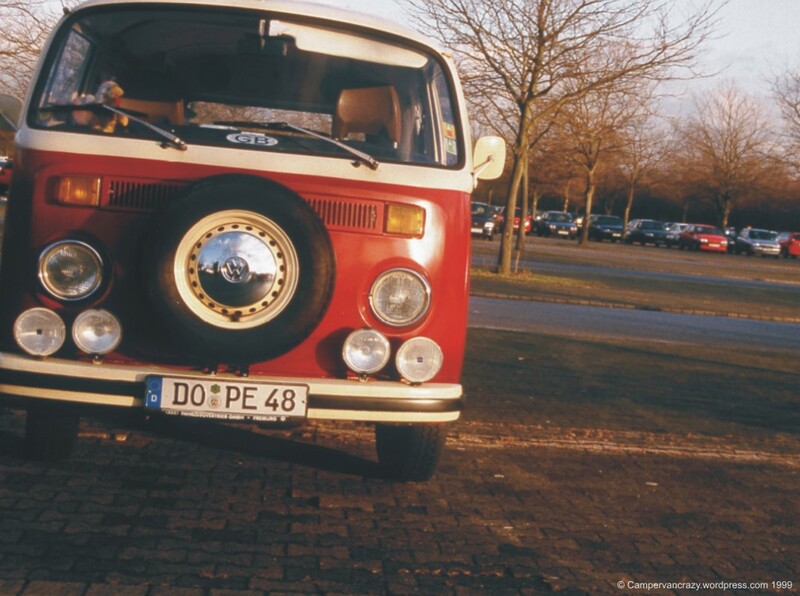 1999 in Dortmund: Even more front lights, front spare wheel and new number plate. Here are some photos of two Late Bay double cabins. The first one is from Geelong, Australia, photos taken in 2012. 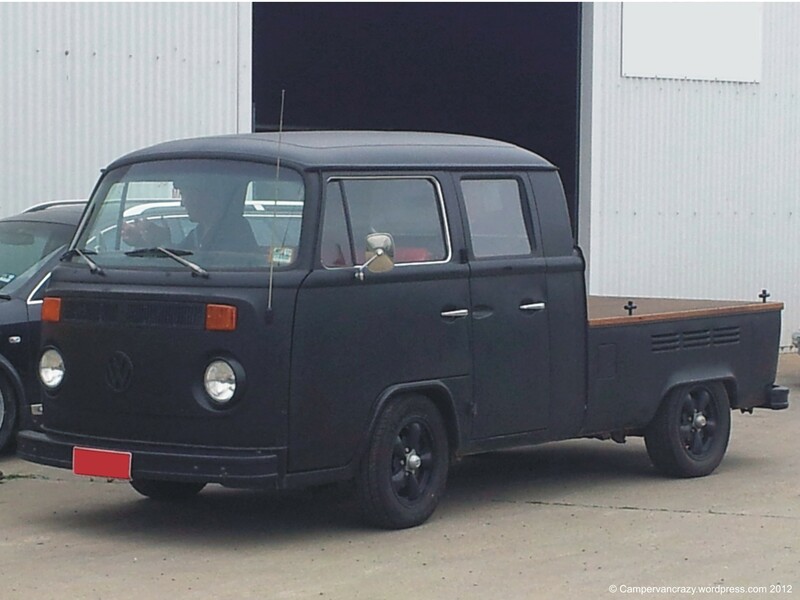 Painted in a cool matt black, including front and back bumpers and rims around the headlights. Boards around the cargo bay removed and cargo area covered with a wooden deck. Wheels could be Porsche Fuchs wheels. 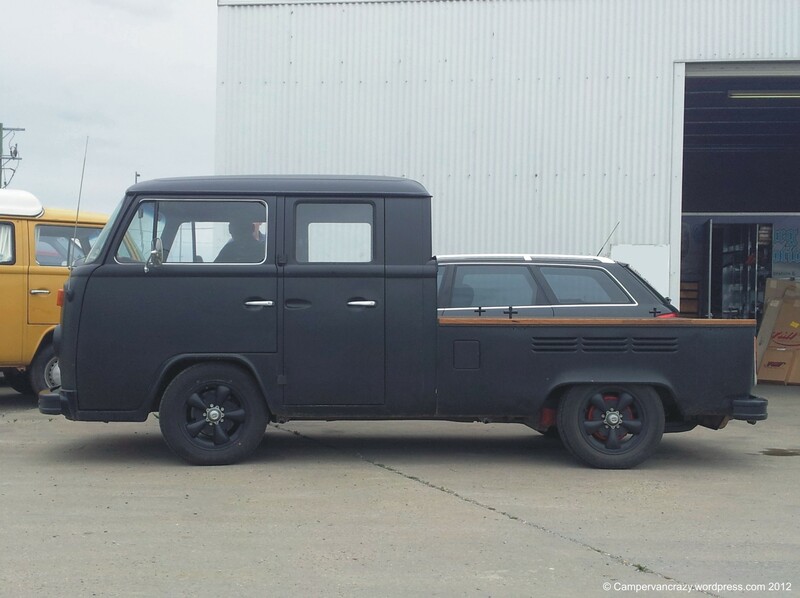 Not the most practical van but a very cool looking one. The other one is from Hamburg, photos from 2005. Except for the improvised paintings, it is probably relatively close to original condition, just a bit run down. Color could be ivory white (color code L567). This paint was used for vehicles of rescue services like the German Red Cross. Perhaps this van started his life as a transporter with one of them. I guess the metal frame on the cargo area in the back may be original and may have been covered by tarps on each side. 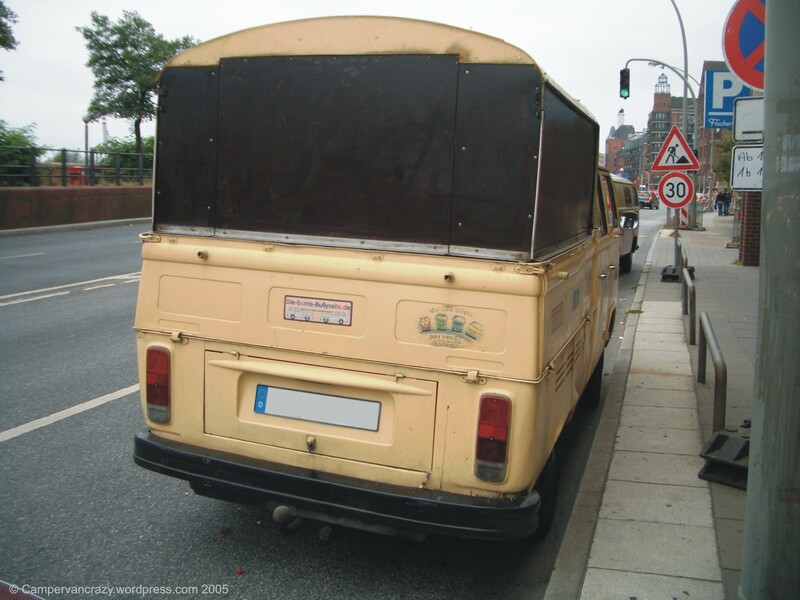 Now replaced with wooden panels so that the cargo space is more solidly covered. 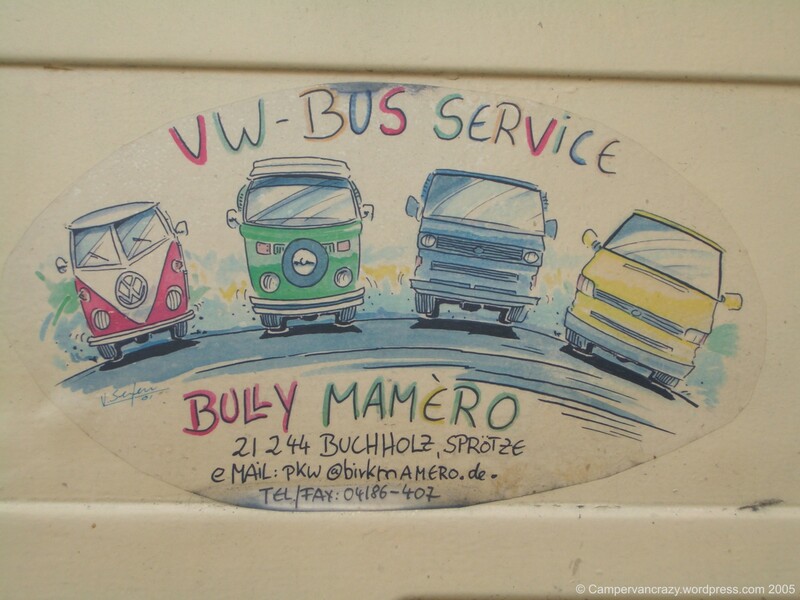 Nice sticker from a VW bus garage in Hamburg which actually still exists (VW Bus Service Mamèro). 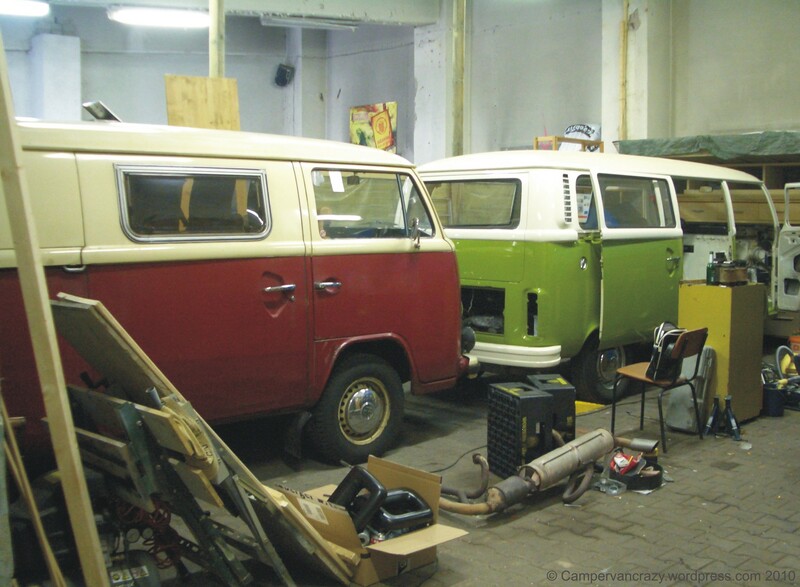 Both buses in the workshop at Berlin Ostkreuz. Aren’t T2s just the best old buses ever?